Tteok (떡) is a class of Korean rice cakes made with glutinous rice flour by steaming. Normal rice flour can be used for some kinds of tteok. There are hundreds of different kinds of tteok eaten year round. In Korea it is customary to eat tteok guk (tteok soup) on New Year's Day and sweet tteok at weddings and on birthdays. It is often considered a celebratory food and can range from rather elaborate versions with nuts and fruits down to the plain-flavored tteok used in home cooking. Some common ingredients for many kinds of tteok are mung bean, red bean, and sweet red bean paste, Korean mugwort, jujube and other dried fruits, sesame seeds and oil, sugar, and pine nuts. Tteok are largely divided into four categories, such as "steamed tteok" (찌는 떡),"pounded tteok" (치는 떡), "boiled tteok" (삶는 떡) and "pan-fried tteok" (지지는 떡). The steamed tteok is made by steaming rice or glutinous rice flour in "siru" (시루), or a large earthenware steamer, so it is often called "sirutteok" (시루떡). It is regarded as the basic and oldest form of tteok. The pounded tteok is made by using a pounding board or mortar after steamed first. In making pan-fried tteok, the rice dough is flattened like a pancake and pan-fried with vegetable oil. 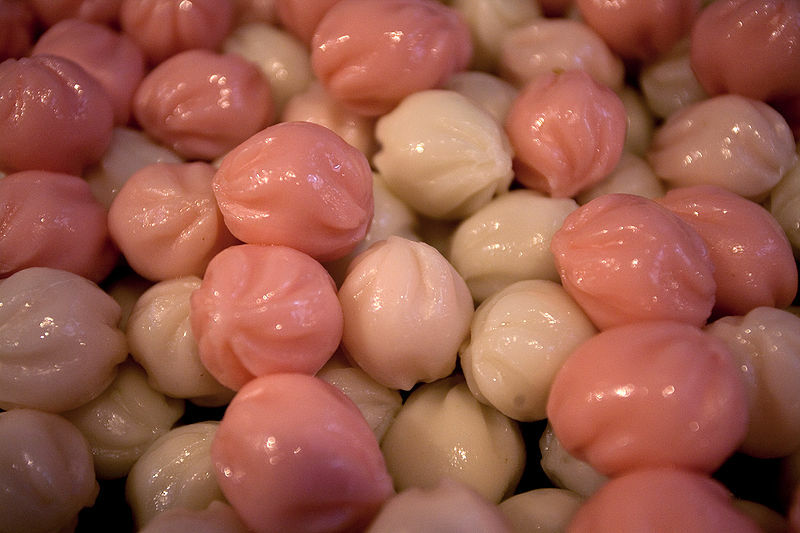 The shaped tteok are made by kneading a dough with hot water which is usually shaped into balls. Tteok is not only one of Korea’s most symbolic foods, but also one of its oldest. Indeed, one of the things most fascinating about the displays is the mind-boggling diversity of sizes, shapes and colors in which tteok manifests itself. And the color is important, too — quite often, rice cakes are chosen for particular occasions thanks to their color and the role they play in Korea’s traditional yin-yang cosmology. Take, for instance, the white garae tteok commonly consumed sliced in tteokguk soup on New Year’s Day. New Year’s Day is traditionally considered a day with a lot of yang, or positive energy. White, too, symbolizes yang, hence the use of white garae tteok. Other colors have their uses, too. Red, for instance, was commonly believed to be effective in scaring away ghosts, goblins and all other manners of things that go bump in the night. On Dongji, the winter solstice, red-bean porridge with rice cakes was served —the long night and its attendant beasties requiring culinary caution. Likewise, on the table of a first birthday, or dol, you’ll find rainbow-colored tteok. This symbolizes the hope that the child’s dreams will grow like a rainbow.